Turkey’s top diplomat has criticized the U.S. resumption of sanctions on Iran as unilateral, not wise and dangerous, calling for a dialogue and compromise. Turkish Foreign Minister Mevlut Cavusoglu, in Tokyo for talks with Japanese leaders, told reporters Tuesday that Turkey opposes sanctions because they don’t achieve results. President Donald Trump’s administration’s resumption of sanctions on Iran took effect Monday, though eight major importers of Iranian oil, including Turkey and Japan, are spared temporarily from immediate penalties. Cavusoglu said one-third of Turkey’s gas imports come from Iran and it’s difficult for any country to immediately diversify their energy mix. He said the U.S. “unilateral” decision affects the world. Israel’s prime minister is lauding the newly restored U.S. sanctions against Iran as “historic,” saying they will “strangle” what he described as Iranian state-sponsored terrorism. The new sanctions against Iran’s shipping, financial and energy sectors come into effect Monday. The U.S. says the sanctions are not aimed at toppling the government, but at persuading it to radically change its policies, including its support for regional militant groups and its development of long-range ballistic missiles. Foreign Ministry spokeswoman Hua Chunying told reporters on Monday that the accord “should be comprehensively and effectively implemented” despite the fact that the United States pulled out of it in May. She also said China stood with those nations that have vowed to keep the agreement alive despite the U.S. withdrawal, and said Iran has been “strictly fulfilling its obligations” under the accord. They blamed Israel for the attack and said it targeted Iran’s communications infrastructure, without elaborating. Iran previously faced a computer virus called Stuxnet, which destroyed thousands of centrifuges involved in Iran’s contested nuclear program in 2011. Stuxnet is widely believed to be an American and Israeli creation, though neither country has acknowledged being behind the attack. Gen. Gholam Reza Jalali, the head of country’s military unit in charge of combatting sabotage, said last week that President Hassan Rouhani’s cellphone was tapped recently. Iran’s foreign ministry is shrugging off the re-imposition of U.S. sanctions on Iran, saying it’s nothing new and that the country has gone through a wider range of sanctions in the past. He also called the sanctions that went into effect on Monday “fruitless” and part of the U.S. propaganda and psychological war against Iran. 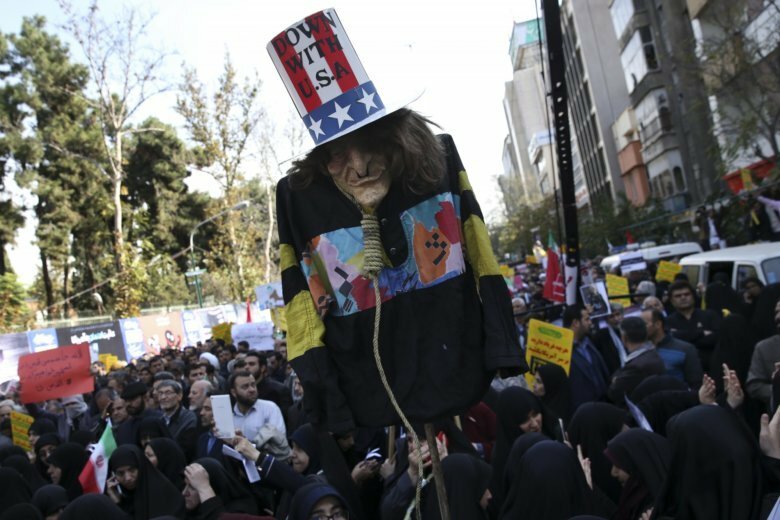 The sanctions end all U.S. economic benefits America granted to Tehran for its 2015 nuclear deal with world powers and in particular target Iran’s vital oil industry. Israel’s defense minister is welcoming newly restored U.S. sanctions against Iran, saying they will deal a “critical blow” to Iran’s military presence around the Middle East. Israel has been a fierce opponent of the 2015 Iran nuclear deal from which the United States withdrew this year, saying the deal didn’t rein in Iran’s regional military activities. The new sanctions against Iran’s shipping, financial and energy sectors, come into effect Monday. The U.S. says the sanctions are not aimed at toppling the government, but at persuading it to radically change its policies, including its support for regional militant groups and its development of long-range ballistic missiles. The developments raise Mideast tensions as America’s maximalist approach to the Islamic Republic takes hold.